Fastest possible wireless charging for your Qi-enabled devices has arrived. The BOOST?UP Wireless Charging Stand 10W delivers 10-watts for faster charging than standard 5-watt chargers, and offers optimal wireless charging for iPhone X, iPhone 8/8 Plus, Samsung, LG, Sony and other Qi-enabled devices. Choose from two different color finishes to find the perfect color for your space. 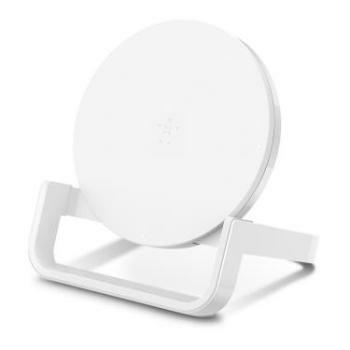 BOOST?UP Wireless Charging Stand 10W offers up to 10-watt wireless charging to optimally charge any Qi-enabled smartphone. This higher wattage means faster charging than 5-watt wireless chargers and standard 5-watt wall chargers typically provided with the smartphones. An original, thoughtful design makes it easy to align your device for optimized wireless charging in either landscape or portrait mode. From browsing a web page to watching a movie, it’s easy to continue using your phone while you charge. Specifically engineered to optimize performance for all Qi-enabled smartphones, the BOOST?UP Wireless Charging Stand 10W not only charges at optimal speed but protects phone functionality while charging. Premium shielding and precision resistors found within this wireless charger minimize interference, ensuring battery life and critical phone functions such as network signal, touchscreen, WiFi, Bluetooth and LTE are not disrupted. Charge without removing your case. The BOOST?UP Wireless Charging Stand 10W is engineered to work with most lightweight plastic cases up to 3mm (not compatible with metal cases).